Zinc aluminum hydrotalcite/graphene oxide (HTC-GO) nanohybrid as inhibition additive for organic coatings was prepared using the co-precipitation method. The synthesized HTC-GO was characterized using Fourier-transform infrared spectroscopy, X-ray diffraction, scanning electron microscopy (SEM), transmission electron microscopy, and thermogravimetric analysis. Surface charge properties of HTC-GO were evaluated with zeta potential measurement. The corrosion inhibition effect of HTC-GO on carbon steel in NaCl solution was investigated using electrochemical methods, energy-dispersive X-ray, and SEM. The effect of HTC-GO on corrosion resistance of epoxy coating applied on carbon steel was evaluated by salt spray test. It was shown that hydrotalcite structures were formed on GO surface, subsequently becoming hydrotalcite/graphene oxide nanohybrid. The results obtained by electrochemical measurements indicate that HTC-GO is an anodic corrosion inhibitor with an inhibition efficiency of about 92% at 1 g/L concentration. 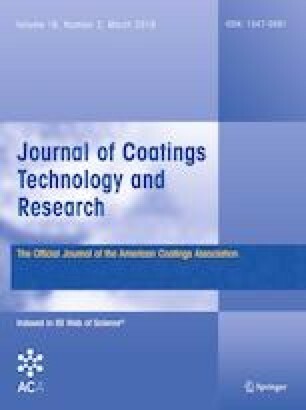 The presence of intercalated GO improved the barrier properties and adsorption of HTC-GO on steel surface. The corrosion resistance of epoxy coatings was improved with 1 wt% HTC-GO. This research is funded by Vietnam National Foundation for Science and Technology Development (NAFOSTED) under Grant Number 104.01-2016.06.